If you ever find yourself in the middle of Central Park on a warm weekend afternoon, and you hear the faint sounds of party music and jubilant celebration, wondering ‘Who are these people, and what are they doing that’s such a blast?’- investigate. You will most likely find yourself in the middle of something truly special- The Central Park Dance Skaters Association. This group of skating enthusiasts have been gathering for weekly meet-ups as The Central Park Dance Skaters Association (or CPDSA) has been skate-dancing officially since 1995, but has been taking place in the park for generations. The first recorded instance of rollerskating in the park dates back to 1890. Vintage photographs show young couples skating in the park throughout the 1920’s and 1930’s, and there are even accounts of skating in the Central Park Bandshell in J.D Salinger’s classic Catcher in the Rye. But the activity truly came to prominence when founder Lezly Ziering taught the city to skate. In 1947 at Stuyvesant High School, Lezly Ziering taught his first dance class. He was fourteen, and taught 75 male classmates how to jitterbug with 75 female students from their sister school. This sparked a love of both teaching and dance in the young teenager, who by the age of sixteen was teaching at the esteemed Fred Astaire studio. He soon began his own dance career, dancing on esteemed NYC variety stages, as well as internationally, dancing Mambo and Samba in the Dominican Republic and San Juan. He soon began dancing with the greats- Martha Graham, Bob Fosse, and Monsieur Pont of the Paris Opera Ballet, to name just a few. He danced on Broadway, toured the world, and appeared in countless films including Marjorie Morningstar, starring Gene Kelly and Natalie Wood. With all of these accomplishments already behind him and achieved, it’s crazy to think his most renown contribution to New York was still ahead of him. 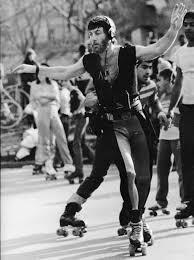 In the late 1970’s, Lezly became enamored with Rollerskating , even adding it to the curriculum and name of his dance school The Lezly Dance & Skate School. To this day, it is the only school of its kind in the United States, offering training in all forms of dance and rollerskating. Lezly also made waves with skating in the professional dance world as well. He taught movie stars such as Donald Sutherland and Michael O’Keeaf how to shine on skates for films, and was a skate consultant for the Broadway productions of Starlight Express and Xanadu. He established the Central Park Dance Skate Association in 1995, which has remained a Central Park institution for over 20 years. In the event of Lezly’s 2015 passing, the CPDSA’s spirit has only grown stronger, honoring their fearless, passionate, and colorful leader. So next time you’re in the park on a sunny afternoon, and hear the sounds of jubilation nearby, follow that sound. You may happen upon something pretty spectacular.